As the first two tight ends taken in the 2017 NFL Draft, Evan Engram and O.J. Howard are linked. The comparison is a natural one to make; the two SEC tight ends were taken just four picks apart, and both projected to be mismatch weapons in the passing game, causing problems for opposing defenses with their size and athletic ability. 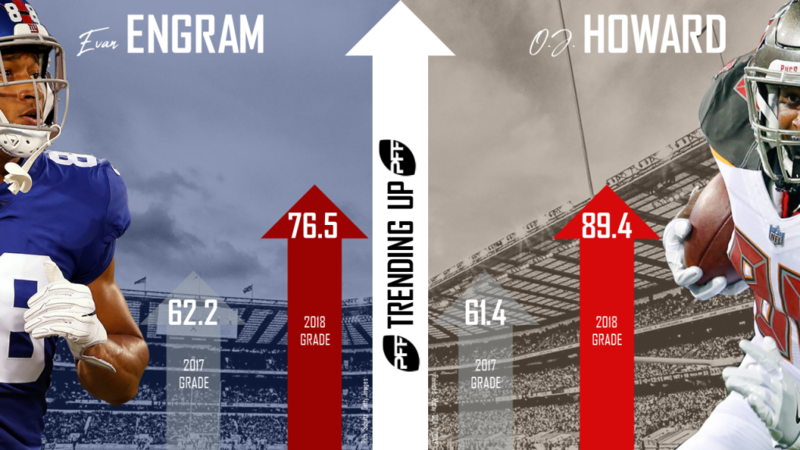 Though they both had some success statistically in their rookie years – Engram with 64 receptions for 722 yards and six touchdowns and Howard with 26 receptions for 432 yards and six touchdowns – neither produced a PFF overall grade that aligned with their first-round draft slot. Both finished with respectable, but uninspiring grades. Engram earned a grade of 62.2, which ranked 35th out of the 72 tight ends with at least 250 offensive snaps played. Howard followed closely behind with an overall grade of 61.4 which ranked 37th. Engram’s grade was brought down in two areas – run blocking and drops. It wasn’t exactly expected that he would enter the league as a strong run-blocker, and that notion played out over the course of his rookie season. His run-blocking grade of 48.7 was the fifth-worst among those 72 qualifying tight ends. In addition, he dropped a position-high 11 passes. No other tight end dropped more than seven, and the only player at all positions with more was Dez Bryant, dropping 12 passes. Though Engram put up numbers, it was largely volume driven. His 108 targets trailed only Travis Kelce. On the other hand, Howard simply wasn’t used all that much as a receiver. In 585 total offensive snaps, he only ran a route on 233 of them. That route rate of 39.8% was right alongside the likes of Garrett Celek, Luke Willson and Rhett Ellison – in a league where passing the ball is king, that is not exactly what you want to see out of a tight end that was taken 19th overall in the draft. He was relatively efficient with his opportunities with 1.85 yards per route run (sixth at the position) and a knack for finding the end zone with six receiving touchdowns (tied for seventh at the position), but the opportunities weren’t coming frequently. Both Engram and Howard built on their rookie campaigns in Year 2, though, in injury-shortened seasons. Howard played just north of 400 snaps due to ankle and foot injuries that placed him on the Injured Reserve, but he finished the season as the second-highest graded tight end behind only George Kittle. Engram finished the 2018 season with an improved grade of 76.5, ranking seventh among tight ends, but if you look at his play after the New York Giants’ bye week, when he was starting to get healthier, he was even better. From Week 10 through the end of the season, Engram’s overall grade of 91.7 led the tight end position. Both were among the top-six at the position in yards per route run among players with at least 40 targets. The two SEC tight ends taken just four picks apart two years ago have followed similar career arcs to this point. Both didn’t quite live up to the first-round billing in terms of PFF grades in their rookie season despite posting respectable numbers. Whether it was blocking, drops or lack of involvement in the passing game, neither Howard or Engram could rise above the middle of the pack at the position. Both elevated their game in Year 2 to sit among the highest-graded players at the position, and both had their potential breakout season shortened by injuries. Both are poised to build on that progression in Year 3 and announce their place among the top tight ends in the NFL.